The recent rally seen in the market is backed by solid flows from foreign investors, reduced geopolitical concerns, pick up in earnings growth as well as expectations of Modi government returning to power with a majority in 2019. In Indian mythology, Holi (also called festival of colours) signifies the victory of good over evil. It also marks the arrival of spring and end of winter. It is also the perfect time to do a rain check of your portfolio investments before the new financial years starts. If you made some investments around Holi last year, which was on March 2, 2018, chances are that you might be sitting on some handsome gains. The S&P BSE Sensex rallied over 4,000 points, or nearly 12 percent, while Nifty50 rose a little over 1,000 points, or nearly 10 percent, in the same period. 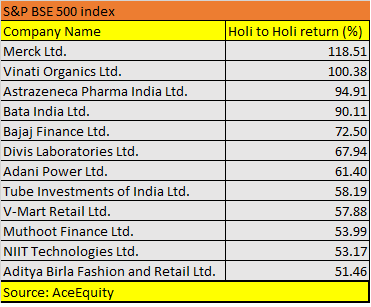 “At the occasion of Holi, one should take a relook at his portfolio to ensure a diversified portfolio (like 7 different colours) with representation from various sectors that are expected to post healthy growth in future. Optimally diversified portfolio ensures secular and healthy growth coupled with a diversification of risk,” Axis Securities said. 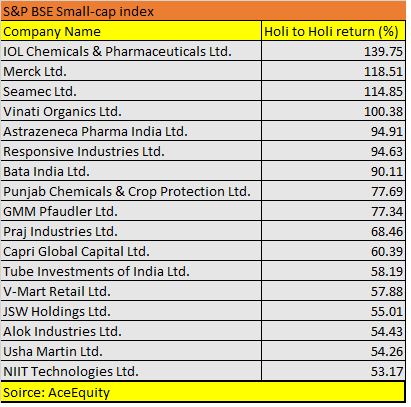 In the last one year, many small & mid-cap stocks stole the limelight from largecaps as nearly 4 stocks in the S&P BSE Smallcap index more than doubled investor wealth in the last one year — IOL Chemicals, Merck, Seamec and Vinati Organics. As many as 17 smallcap stocks rallied over 50 percent in the same period which includes NIIT Technologies, Usha Martin, Alok Industries, Tube Investments, JSW Holdings, V-Mart, Capri Global, and Bata India. In the S&P BSE 500 index as many as 12 stocks rose 50-100% which include names like Aditya Birla Fashion, Muthoot Finance, V-Mart, Adani Power, Divi’s Laboratories, Bajaj Finance, NIIT Technologies and Astrazeneca Pharma. Axis Securities likes NIIT Technologies as well as Divis Laboratories from the above list. Selection of sectors will be key for outperformance in the next 12-months, suggest experts. Goldman Sachs, which upgraded Indian markets to overweight on March 18, increased the cyclicality in their sector allocations and upgrade PSU banks, industrials, and autos to overweight. However, it downgraded tech, metals, and NBFCs to underweight. Thematically, Goldman prefers domestic cyclicals over defensives and exporters. Among financials, Goldman Sachs upgrades PSU Banks to overweight given sharp improvements in asset quality trends, attractive valuations and likely pick-up in credit growth (as banks come out of narrow banking/PCA and likely gain some market share from NBFCs).